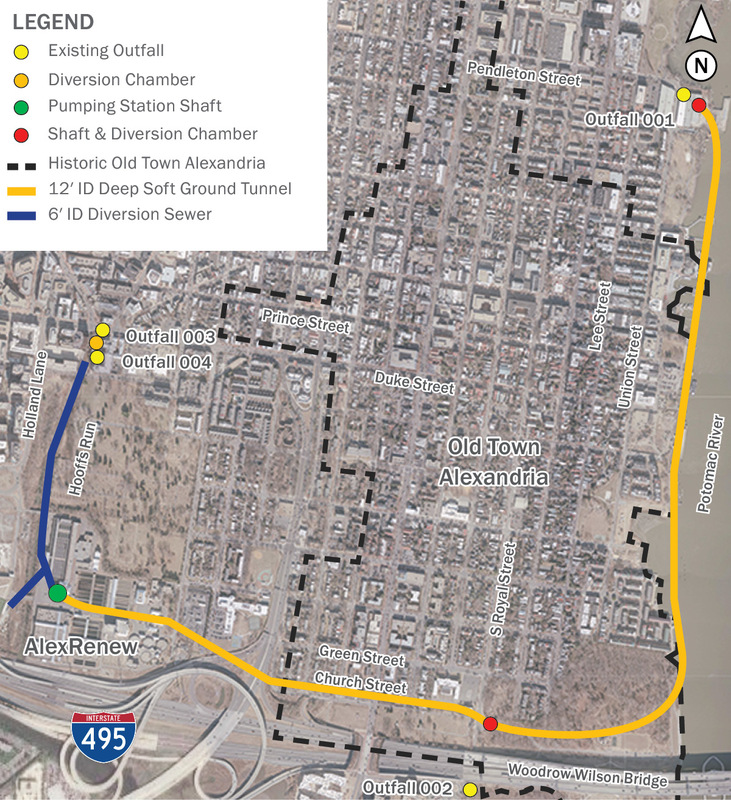 In response to a 2017 Virginia State Law, Alexandria Renew Enterprises (AlexRenew) has put forth a plan to address the discharge of combined sewage to Alexandria, Virginia’s waterways. The plan, dubbed “RiverRenew” includes four major projects that include: a storage and conveyance tunnel system (Tunnel System), upgrades to AlexRenew’s primary pumping capacity at its wastewater plant, relocation of facilities and decommissioning of its former administrative building, and a wet weather treatment system. Mechanical, electrical, and instrumentation equipment. The schedule stipulated by the 2017 Virginia State Law requires that the Tunnel System and other controls to be in place by July 1, 2025. To accommodate this schedule, AlexRenew and their Owner’s Advisor are working on a parallel track to advance conceptual-level designs, comply with the National Environmental Policy Act, which the team is accomplishing through an Environmental Assessment with the National Park Service, and acquire the necessary permits and agreements needed to build the Tunnel System. The Tunnel System Project will be procured through a two-step Fixed-Price, Design-Build process, with an anticipated Request for Qualifications (RFQ) issue date of June 2019. The RFQ will seek experience and qualifications for the items listed above, along with experience in working in an urban environment. In addition to the Design-Build RFQ, AlexRenew will also request statements of qualifications and experience for resident engineering and inspection services in November 2019. Construction of the Tunnel System is anticipated to begin in 2021 and be complete before mid-2025. For more information regarding RiverRenew and the Tunnel System Project, click here.